It’s possible that cases of tooth decay could be too severe for a common filling to treat. Does that mean that patients have to have a crown placed instead? Actually, there’s a third option: inlays and onlays. 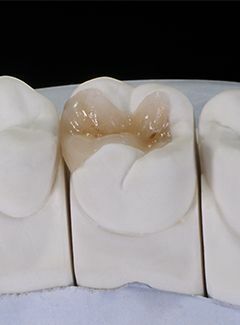 These restorations are placed into the tooth in a similar way to a filling, but they’re actually milled like a crown. An inlay is designed to fit between the cusps of a tooth, while an onlay fits entirely over one or more cusps. Overall, inlays and onlays are great options when it comes to preserving natural tooth structure, and our dentists are happy to provide them at either our Silver Lake or Topeka office locations. Why Choose Michel Dental for Inlays & Onlays? Inlays and onlays typically require two appointments to be successfully placed. During your first visit, we will remove the old filling and current decay, thoroughly cleaning the area. After a dental impression is taken, that important information is sent off to a trusted dental lab where the final product will be created. In most cases, we can place a tooth-colored inlay or onlay for optimum aesthetic benefit in the teeth that show when you smile. We’ll provide a temporary in the meantime. When our team receives your new inlay or onlay, one of the dentists will securely cement it in place and perform any needed modifications at that point. We won’t rest until you’re fully satisfied with your stronger, healthier smile! Contact Michel Dental today if you have any questions about this treatment option, or if you’d like to schedule your first appointment.